, an eminent English divine, was born in March 1619, at Uppington near the YVrekin in Shropshire. He was at first educated at a free-school in that neighbourhood, and afterwards removed to one at Coventry, taught by Philemon Holland the translator. In 1636, he was sent to Oxford, and entered a commoner in Christ-church, under the tuition of Mr. Richard Busby, afterwards master of Westminster school. Six months after his settlement in the university, Dr. Fell, dean of Christ-church, having observed the parts and industry of young Allestry, made him a student of that college, where he applied himself to his books with great assiduity and success. When he had taken the degree of bachelor of arts, he was chosen moderator in philosophy, in which office he continued till the disturbances of the kingdom interrupted the studies and repose of the university. 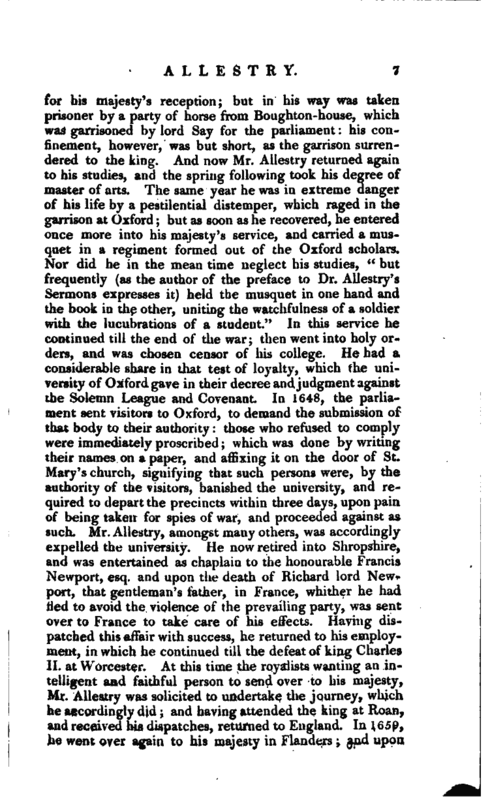 In 1641, Mr. Allestry, amongst other of the Oxford students, took ar;ns for the king, under sir John Biron, and continued therein till that gentleman withdrew from Oxford, when he returned to his studies. Soon after, a party of the parliament forces having entered Oxford and plundered the colleges, Mr. Allestry narrowly escaped being severely handled by them. Some of them having attempted to break into the treasury of Christ-church, and having forced a passage into it, met with nothing but a single groat and a halter, at the bottom of a large iron chest. Enraged at their disappointment, they went to the deanry, where having plundered as much as they thought fit, they put it all together in a chamber, locked it up, and retired to their quarters, intending next day to return and dispose of their prize; but, when they came, they found themselves disappointed, and every thing removed out of the chamber. Upon examination it was discovered, that Mr. Allestry had a key to the lodgings, and that this key had been made use of. Upon this he was seized, and would probably have suffered severely, had not the earl of Essex called away the forces on a sudden, and by that means rescued him from their fury. In October following, he took arms again, and was at the battle fought betwixt the king and the parliament’s forces under the command of the earl of Essex upon Keinton-field in Warwickshire; after which, understanding that the king designed immediately to march to Oxford, and take up his residence at the deanry of Christ-church, he hastened thither to make preparations | for his majesty’s reception; but in his way was taken prisoner by a party of horse from Boughton-house, which was garrisoned by lord Say for the parliament: his confinement, however, was but short, as the garrison surrendered to the king. And now Mr. Allestry returned again to his studies, and the spring following took his degree of master of arts. The same year he was in extreme danger of his life by a pestilential distemper, which raged in the garrison at Oxford; but as soon as he recovered, he entered once more into his majesty’s service, and carried a musquet in a regiment formed out of the Oxford scholars. 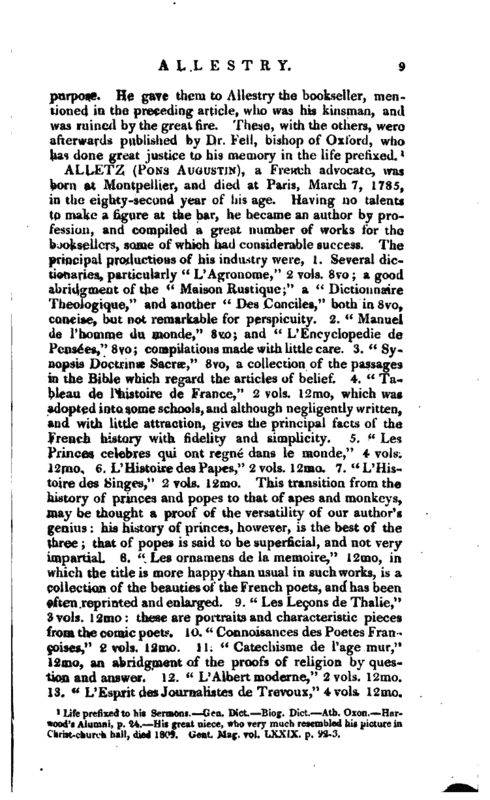 Nor did he in the mean time neglect his studies, “but frequently (as the author of the preface to Dr. Allestry’s Sermons expresses it) held the musquet in one hand and the book in the other, unitinEf the watchfulness of a soldier with the lucubrations of a student.” In this service he continued till the end of the war; then went into holy orders, and was chosen censor of his college. He had a considerable share in that test of loyalty, which the university of Oxford gave in their decree and judgment against the Solemn League and Covenant. In 1648, the parliament sent visitors to Oxford, to demand the submission of that body to their authority: those who refused to comply were immediately proscribed; which was done by writing their names on a paper, and affixing it on the door of St. Mary’s church, signifying that such persons were, by the authority of the visitors, banished the university, and required to depart the precincts within three days, upon pain of bein,; taken for spies of war, and proceeded against as such. 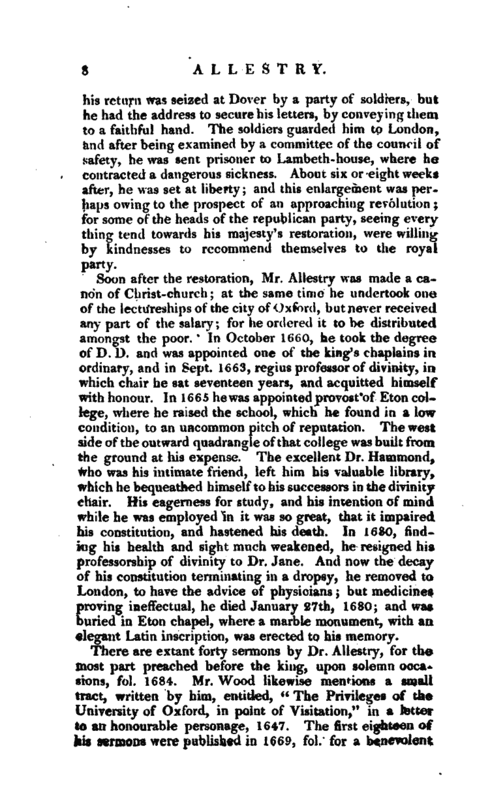 Mr. Allestry, amongst many others, was accordingly expelled the university. He now retired into Shropshire, and was entertained as chaplain to the honourable Francis Newport, esq. and upon the death of Richard lord Newport, that gentleman’s father, in France, whither he had Hed to avoid the violence of the prevailing party, was sent over to France to take care of his effects. Having dispatched this affair with success, he returned to his employment, in which he continued till the defeat of king Charles II, at Worcester. At this time the royalists wanting an intelligent and faithful person to send over to his majesty, Mr. Allestry was solicited to undertake the journey, which he accordingly did; and having attended the king at Roan, and received his dispatches, returned to England. In 1659, he went over again to his majesty in Flanders; and upon | his return was seized at Dover by a party of soldiers, but he had the address to secure his letters, by conveying them to a faithful hand. The soldiers guarded him to London, and after being examined by a committee of the council of safety, he was sent prisoner to Larnbeth-house, where he contracted a dangerous sickness. About six or eight weeks after, he was set at liberty; and this enlargement was perhaps owing to the prospect of an approaching revolution; for some of the heads of the republican party, seeing every thing tend towards his majesty’s restoration, were willingby kindnesses to recommend themselves to the royal party. 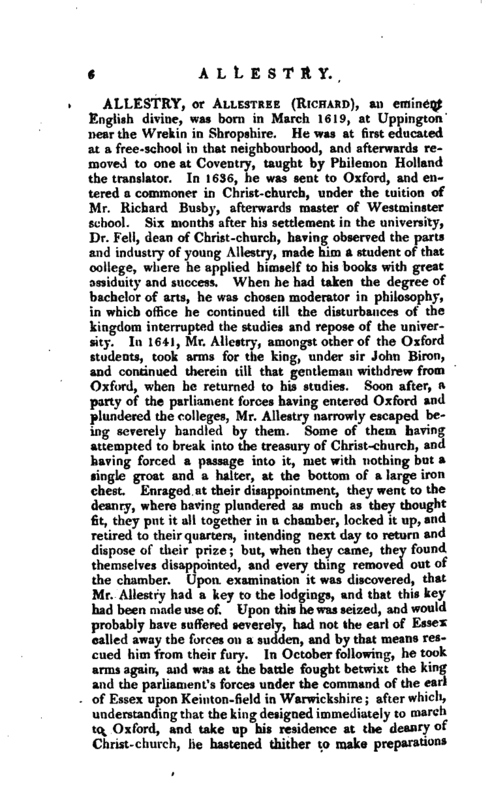 Soon after the restoration, Mr. Allestry was made a canon of Christ-church; at the same time he undertook one of the lectureships of the city of Oxford, but never received any part of the salary; for he ordered it to be distributed amongst the poor. In October 1660, he took the degree, of D.D. and was appointed one of the king’s chaplains in ordinary, and in Sept. 1663, regius professor of divinity, in which chair he sat seventeen years, and acquitted himself with honour. In 1665 he was appointed provost of Eton college, where he raised the school, which he found in a low condition, to an uncommon pitch of reputation. The west side of the outward quadrangle of that college was built from the ground at his expense. The excellent Dr. Hammond, who was his intimate friend, left him his valuable library, which he bequeathed himself to his successors in the divinity chair. His eagerness for study 3 and his intention of mind while he was employed in it was so great, that it impaired his constitution, and hastened his death. In 1680, finding his health and sight much weakened, he resigned his professorship of divinity to Dr. Jane. And now the decay of his constitution terminating in a dropsy, he removed to London, to have the advice of physicians; but medicines proving ineffectual, he died January 27th, 1680; and was buried in EJton chapel, where a marble monument, with an, elegant Latin inscription, was erected to his memory. Life prefixed to his Sermons.—Gen. Dict.—Biog. Dict.—Ath. Oxn.—Harwood’s Alumni, p. 24.—His great niece, who very much resembled his picture in Christ-church hall, died 1809. Gent. Mag. vol. LXXIX. p. 92-3.